The achievements of a legendary Durham swimmer are now on display at Freeman’s Quay Leisure Centre. Visitors will be able to view a prestigious trophy won by Durham-born Norman W. Sarsfield OBE MC (1920 – 2003) and to read about his many other accomplishments. 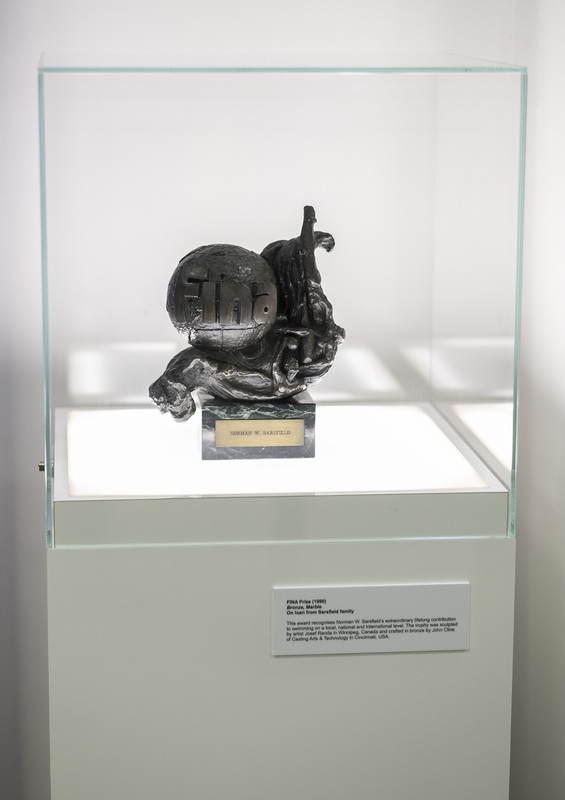 The trophy on display is The FINA Prize, which was presented to Norman by the Federation Internationale de Natation, the world governing body of swimming, in 1990. This prestigious award recognised Norman’s lifelong contribution to swimming on a local, national and international level. Norman was Durham City’s swimming champion an incredible nine times. But it was as a coach that he had the biggest impact. After serving in the Durham Light Infantry in World War Two, he trained swimmers and divers who went on to win Commonwealth and Olympic medals. From 1955 to 1969, Norman coached the Great Britain swimming team. He also coached Britain’s 1968 Olympic team in Mexico, the British team at the 1975 World Championships in Columbia, and the European team at the 1979 FINA World Cup in Tokyo. Norman wrote four successful books based on his experiences. To date, he is the only British person to have been awarded the FINA Prize. 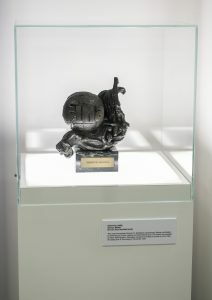 The trophy is accompanied by a panel and timeline that record Norman’s achievements, both within the sport of swimming and in the wider world. Such achievements include receiving the Military Cross for gallantry under fire, winning gold medals in army swimming contests, acting as a Durham City councillor between 1955 and 1969, and serving as Mayor of Durham from 1964 to 1965. 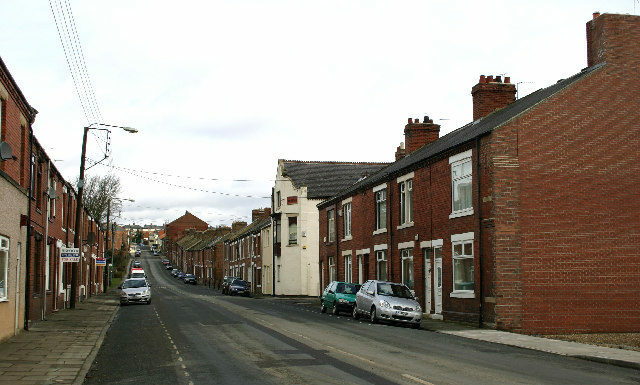 Norman also played a key role in bringing the 2002 Commonwealth Games to Manchester. 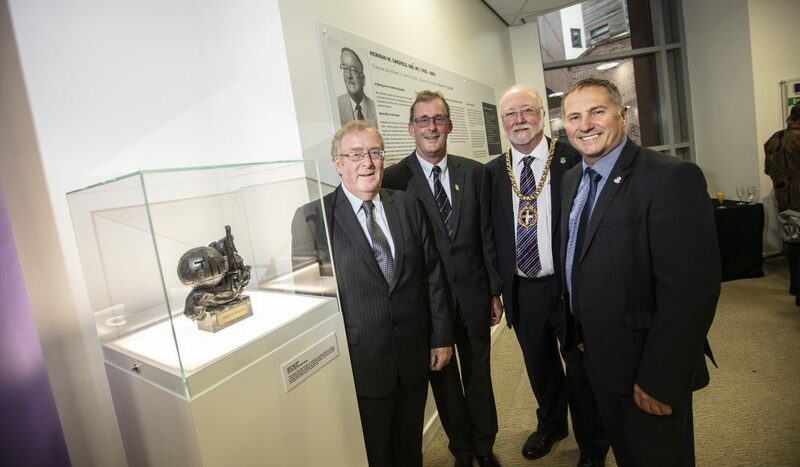 The trophy was unveiled at Freeman’s Quay on September 20th in a ceremony attended by Durham County councillors and leading figures in the world of swimming. For more information about Freeman’s Quay Leisure Centre, please visit https://www.durham.gov.uk/article/18726/Freeman-s-Quay-Leisure-Centre. You can learn more about Norman W. Sarsfield at https://ishof.org/norman-sarsfield-(gbr).html.